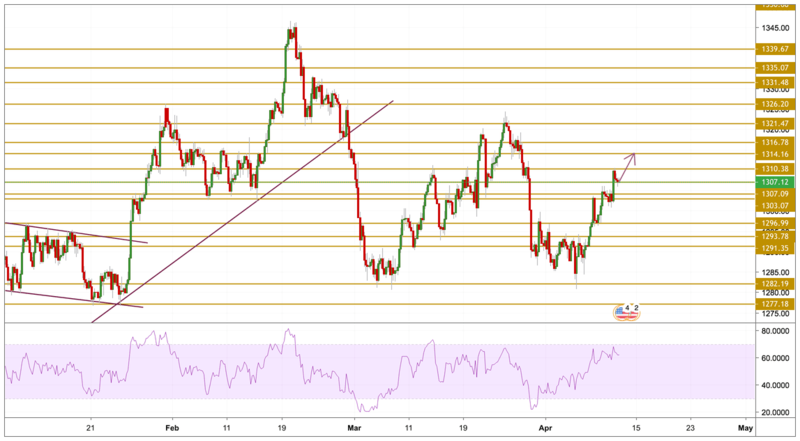 During yesterday's session and ahead of the FOMC minutes, the US Dollar retreated across the board, favoring the move to the upside in gold prices that reached 1310 per ounce, the highest level since March 28. However, during today's early session, the prices fell amid renewed trade optimism. Brexit development was also in focus as the EU and the UK agreed to an extension of the Brexit deadline until October. The US and China have agreed on a mechanism to police any trade agreement they reach, US Treasury Secretary Steven Mnuchin told CNBC on Wednesday. As expected, Gold prices continued to climb reaching the $1310.38 resistance level on some renewed momentum. However, the price retreated again and headed towards the $1307.09 support level to rest and is still currently hovering around it. Even though we are not witnessing some big moves, Gold can pick up some traction on the momentum as it has enough room to go before entering the overbought zone. We will be focusing on the upside especially on the $1314.16 resistance level.